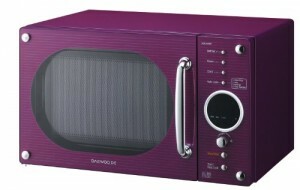 Ideal for those looking for a retro looking purple microwave - reasonably priced too. Might not suit all kitchens - entirely down to personal taste. 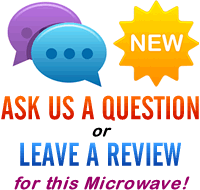 We've already reviewed this microwave, albeit a version finished in a different colour scheme, and so won't go into too much detail, simply as it's already been covered once. Essentially the Daewoo KOR6N9RP is an entry level 20 litre, 800 w microwave, with 5 different power settings, a child safety lock, finished in a gloss purple colour. If you're looking to find a purple microwave, then your options are somewhat limited - this is one of very few on the market. This particular Daewoo microwave works well, and due to it's modest 20 litre capacity is a sensible size, without taking up too much room in your kitchen. The controls are simple to operate, and although it is a touch noisy, it cooks well, without any noticeable cold spots or uncooked areas. Overall although this model doesn't especially stand out in terms of performance or value, simply as there are a lot of similarly specced microwaves on the market for around the same price However, it does work well, seems to be reliable and will be ideal for those looking to match their microwave with their purple kettles and toasters. Works pretty well, decent capacity and very purple! If you've been searching for a retro looking purple microwave to suit your kitchen, then this might just tick that box.